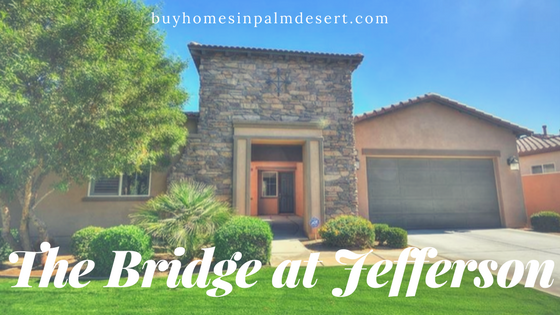 The Bridge at Jefferson is a community located in Indio California. Just minutes to La Quinta and Highway 111, this community is located near popular shopping, restaurants, and entertainment. The Bridge at Jefferson is a gated community with three different floor plans built by Lennar. It offers unique Spanish revival, old hacienda, and Tuscan style architecture. These homes were only built in the last 10 years and run approximately $450,000-$520,000. There's a variety of single and two-story homes, 3 to 5 bedrooms and sizes from 2200 to over 2800 ft.². Lennar has a gold package offered with some of their units featuring upgraded GE Profile stainless steel appliances, five burner gas cooktop, built-in self-cleaning ovens, microwave, dishwasher, and large side-by-side refrigerator. It also includes upgraded designer cabinetry with adjustable rollout shelving and all base cabinets in the kitchen, slab granite countertops throughout and stone backsplash. These homes offer large lots and open floor plans. It's perfect for full-time or seasonal homeowners. This community requires monthly homeowners dues of about $120 per month (as of the publishing of this article), which covers all common area maintenance and landscaping. Many homes offer private swimming pools and hot tubs and of course, pets are allowed. Those with school-age children are served by the Mountain Vista elementary school, the Cahuilla Desert Academy Junior high school and the Coachella Valley high school. 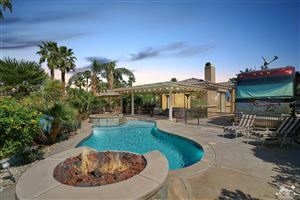 The Bridge sits between Rancho La Quinta Golf Club and the Motorcoach Country Club just south of Avenue 48. It features a total of about 125 homes. For more information on this community or others, please contact me here.